Jimmy Cricket had a trip down memory lane recently when he was reminded of his appearance on BBC’s Pebble Mill at One more than 22 years ago. The famous comedian appeared on the show, hosted by Ross King, along with The Barron Knights, a British humorous pop group, originally formed in 1959 in Leighton Buzzard, Bedfordshire. 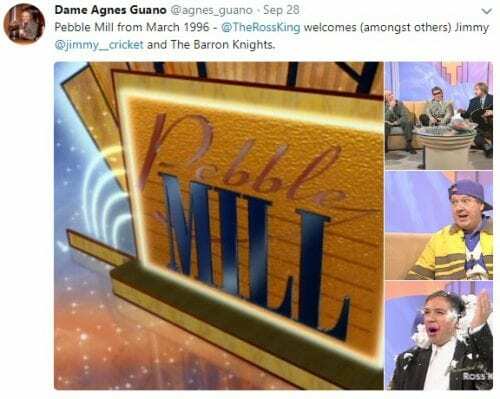 Pebble Mill at One was a live daily chat show broadcast on weekdays at 1pm on BBC One, screened from 2 October 1972 to 23 May 1986 and again from 20 October 1991 to 25 May 1996. It was transmitted from the Pebble Mill studios at BBC Birmingham, being hosted unusually from the centre’s main foyer area, rather than a conventional television studio. It was a posting on social media channel Twitter, which provided the flashback for Jimmy. Ross King MBE is a Scottish television presenter, actor and writer best known for being LA Correspondent for ITV breakfast programmes Lorraine and Good Morning Britain. He hosted Pebble Mill at One for five years. 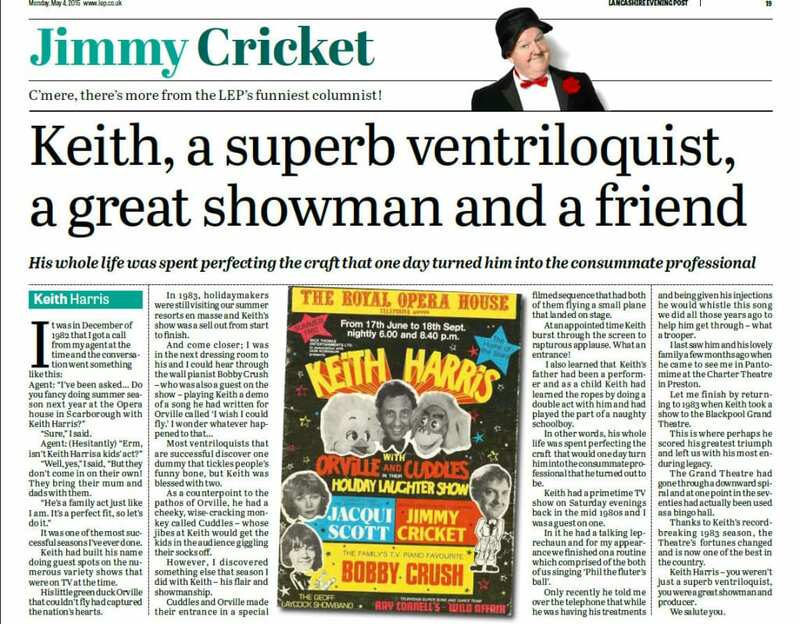 Jimmy Cricket was recently reminded of the days when he worked at a Pontins holiday village where fellow TV star Shane Richie was the entertainments manager! Terri Gardner, who worked with Jimmy in the early 1980s, sent the photo above via a Facebook message. 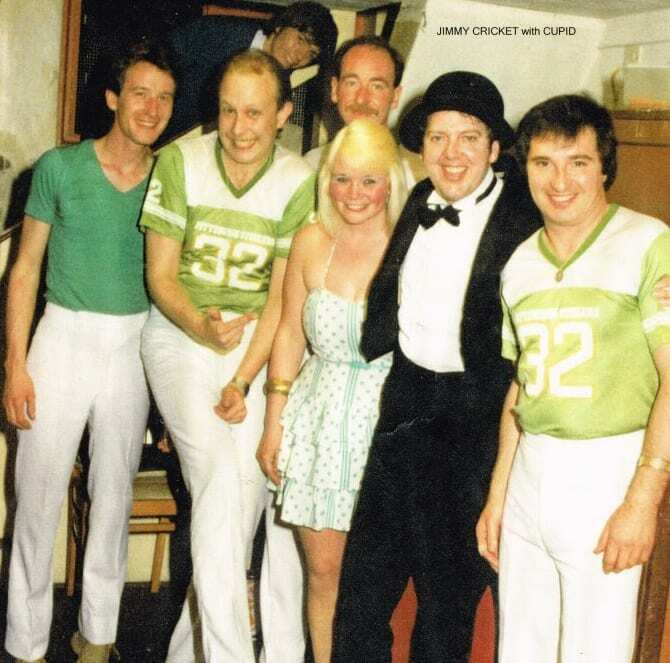 The picture features Terri and her partner, Ron, and the rest of their band alongside Jimmy at the Pontins holiday village called Little Canada on the Isle of Wight back in 1983. Richie is an English actor, comedian, singer and media personality, well-known for his portrayal of the character Alfie Moon in the BBC One soap opera EastEnders.